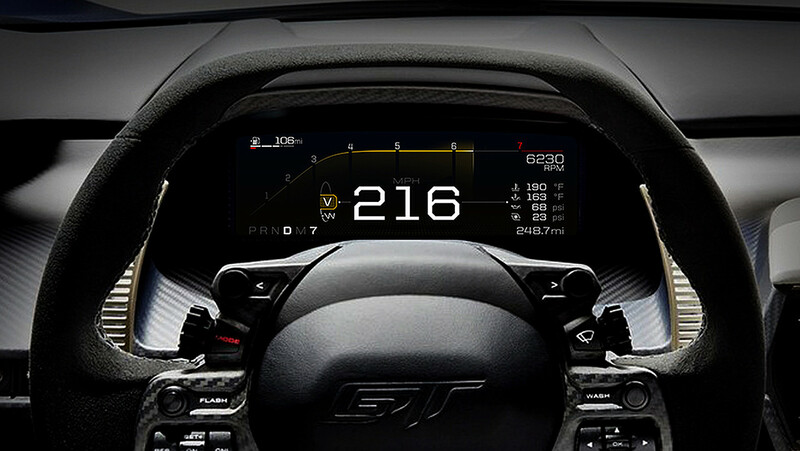 If you’ve been paying attention, you know that the game-changing digital instrument panel of the all-new, 2017 Ford GT supercar has been shown to the public. As it turns out, one of Ford’s photos of the new digital IP contained a rather juicy detail – assuming it can be trusted. Specifically, Top Gear noticed that the photo captured a speed readout of 216 mph, meaning that the new Ford GT ought to be able to achieve a speed of at least that. That’s about 10 mph faster than the 2005-’06 Ford GT’s top speed, and objectively pretty darn impressive. The 2017 Ford GT is powered by a twin-turbocharged, 3.5-liter EcoBoost V6, coupled with a 7-speed dual-clutch automatic transmission. We still don’t know how much power the engine produces in this application, although it should exceed 600 horsepower. Five different drive modes allow the supercar to reconfigure itself to suit specific tasks, like driving in inclement weather in Wet mode, or chasing top speed in V-Max. The vehicle ride height, stability control, and aerodynamics are all optimized on-the-fly.